Close view of arched niche in Islam Shah's Tomb, Sasaram. bl.uk > Online Gallery Home	> Online exhibitions	> Asia, Pacific and Africa Collections	> Close view of arched niche in Islam Shah's Tomb, Sasaram. 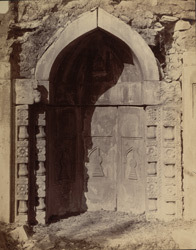 This photograph shows a general view of the tomb of Islam Shah at Sasaram taken by Joseph Beglar for the Archaeological Survey of India in 1870s. Islam Shah, son and successor to Sher Shah Suri, planned a tomb of considerable size which dates to around 1550. However it was never completed due to his premature death soon after and subsequent civil war in the Suri territories. Like that of Sher Shah Sur, the unfinished tomb was designed to be surrounded by water and its construction was begun on an artificial island in a tank. The Bengal List records that it is "approached by a stone bridge, formed of flat slabs resting on piers and supporting projecting bays. There are eleven openings in the bridge, each 33 feet broad by 500 [surely 50?] long." The photograph shows a prayer niche within the tomb of Islam Shah.